Looking for Conveyancing Solicitors Bournemouth? Buying and selling a home can take up a lot of time. It can be stressful. And there’s a lot that can go wrong. Everyone will be offering you their services for "Conveyancing". And even your estate agent will be "recommending" someone. you check whether there is a long-term lease on the roof space. 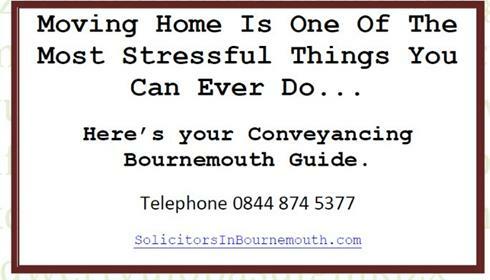 legal advice - please get in touch with us for information on this - Conveyancing in Bournemouth. Your ideal way to get moving in the Bournemouth and Poole area is with experts. You want Conveyancing experts handling it for you so you don’t have to worry. Don't be penny wise and pound foolish when it comes to your biggest monetary investment. You know you have to get it right. What You Want From Your Conveyancer. We have a Conveyancer Checklist that you'll appreciate. Take a look at our Checklist and what we promise to do. Because we have DECADES of experience and hundreds of successful Conveyancing clients from the Bournemouth area we guarantee our work for you. You can see for yourself how complex the process can be. Do you think a company would do a good, thorough and guaranteed service for £89? The fact is that you get what you pay for. We are not the least expensive. And if you are looking for the cheapest I recommend searching on Google for "cheap conveyancing". You'll probably never speak to the same person twice, have trouble getting through and certainly won't get a dedicated service that keeps you up to date with your most important transaction. (And you'll see a host of "hidden" extras to pay for). Conveyancing with an expert gets you the property you want. It's important to use experts you can trust. Experts can work fast without sacrificing quality. This can be important to prevent gazumping, because sellers can accept other offers, even when they have accepted yours. That's because until contracts are exchanged a seller can change their mind on who to sell the house to. It's added stress that you want a solicitor like us to handle for you. You don't have to wait until you've found your dream home to instruct us. There's a lot of work involved in Conveyancing and the earlier we start work the better. And with the option of "no-move, no-fee" insurance you won't have to pay if your move doesn't go ahead for any reason. The solicitor's basic fee (i.e. what it costs to do the work). The disbursements (these are things a we have to pay other people for on your behalf e.g. Local Authority Searches, Stamp Duty and so on). The disbursements should be the similar from one conveyancing quote to the next (they are fixed charges). A little trick some conveyancing firms like to employ is to invent disbursements. If you have a quote and you want us to check it out for you feel free to email or fax it through. We'll give you our opinion for free. If your estate agent insists on you using "their preferred partners" be aware that you don't have to follow their advice. They may be receiving large commissions which may mean you aren't getting the best advice. You've got a mind of your own so get independent advice. We hope that you'll call us to have a chat about your move. We can answer any questions you may have. We're here to male it stress-free, swift and easy. PS - we've compiled 15 Tips For A Successful House Move. It's yours for FREE.You can get it by clicking on the link below. PS Before you buy a house with Solar panels installed you need to ensure that you check whether there is a long-term lease on the roof space. The Royal Institute for Chartered Surveyors is recommending you take legal advice - please get in touch with us for information on this - Conveyancing in Bournemouth. early to appoint your conveyancing team. That’s because it isn’t simple. Exchange of Contracts is the first stage. right to claim the costs back. outcome. Not something you want to get involved in. These Stages Are Designed For You To Have Time To Think. 1. A property that is subsiding or is damp. likely to get permission too. it’s ok just to tell the Estate Agents you don’t want to go ahead. prepared to take an enormous risk. Of course, we advise against risk when it comes to a major purchase. reasons why this chain can have a weak link. Sometimes a person loses their job and can’t go ahead with a purchase. people there are in the chain the more it gets delayed. Before Exchanging Contracts What Happens? rely on the seller’s survey, (it’s not written for you). And even a survey that is done by your mortgage company isn’t really enough. It’s a valuation to make sure what you are borrowing is the right amount and that the property is worth it. There’s really no substitute for a full structural survey. It may cost a few hundred pounds. But it could reveal things which may cost a few thousand or even tens of thousands of pounds to put right. When you get the survey report take time to read through it. It will be a thorough document highlighting all sorts of things. Its ultimate objective is to tell you whether the price you are paying is reasonable for the condition of the property you are buying. What can you do with the survey results? Get a lower price – if the survey shows there’s a lot of work to be done on the property you can ask for a price reduction. Ask the agent. Stop yourself from making a mistake – if the survey comes back and the mortgage company won’t lend because of the poor state of the propertythen you could pay cash but bear in mind that it could be hard to resell the property in the future. What About Mortgages? What Does A Solicitor Do? Solicitors aren’t able to give advice on which mortgage company you should choose. That’s what a financial adviser is for. (Many of whom refer to one company only...so check their independence to get you the best deal if you are using one). We can tell you that to buy a house you will have to have a written mortgage offer. A “loan in principle” is not enough. To get a written mortgage offer the lender will want certain information. A survey by their own surveyor to check the house is worth the price you are paying. Written confirmation of your income to see if you can afford the repayments. And to check that you are not in debt, which would prevent you from keeping up with mortgage payments. To do all this can often take a couple of weeks or more. And if you think it’s dragging on then please contact the lender or whoever is arranging your mortgage. Solicitors generally don’t have contact with the lender until the written offer is issued. When you get the written offer you might have to sign one copy and return itto the mortgage company. Make sure the mortgage offer is enough to buy thehouse, along with any other money you may have to make up the difference. And a mistake we do see from time to time is that people forget other costs such as conveyancing, estate agent fees, removal expenses and stamp duty. Make sure you have enough money to pay for these things. The mortgage offers themselves vary between lenders. Often there are deductions in the amount the mortgage company hands over to us. For example, they may take off a month’s interest or have a high loan to value fee they have already deducted. So the full amount of the loan may never reach the solicitors. Be aware of this. When your mortgage company issues the offer, they will send details to thesolicitor who is handling the conveyancing. Normally this would be us as it makes sense not to pay two sets of solicitors to handle the buyer’s conveyancing. But sometimes mortgage companies insist on using their own solicitors and that means you have extra costs to pay. This also slows the process down as there are now the buyer’s solicitors, the seller’s solicitors and the mortgage company’s solicitors involved in a chain. Now let’s go into more detail so you can see why it makes sense to hire us in Bournemouth to do the conveyancing for you. HIP’s (Home Information Packs) are not needed any more to sella house as they were scrapped in May 2010. But you still need an Energy Performance Certificate, otherwise known as an EPC. This certificate gives an energy rating for your home. The EPC provides a rating of the home’s energy efficiency by rating the performance of the building itself in areas such as heating and lighting. There are many independent energy assessors who can prepare an EPC. And we can recommend reliable providers, if you would like us to. Supplying us with the Deeds to your property. We need the Deeds to your property or an official Land Registry copy to start the conveyancing process. The Deeds might be with your mortgage company or you may have them yourself or they may be with another solicitor. You will probably have to write to them to give permission for the Deeds to be sent to us. Supplying us with your mortgage details. If you have a mortgage then we need the mortgage providers name and address, and your account number (this is important) as soon as possible is recommended. Paperwork we need for the buyer’s solicitor. The buyer’s solicitors will need a lot of information about the property. We’ve got forms for you to fill in to make this easier. But please read the forms carefully because they are part of the legal paperwork that forms the sale. If you don’t know any of the answers then just write “don’t know” on the form. What does the buyer’s solicitor do with this paperwork? The buyer’s solicitor will check over the paperwork and probably come back with some relevant questions. You might have to help us answer them. This could be to do with fixtures and fittings, for example, what is going to stay in the property and what is going to be removed. Things which are fixed to the property are generally considered to be fixtures and expected to remain in place. If there’s any doubt it is better to specify certain “fixtures” you will be taking with you. Because if you don’t and the buyer objects to something you have removed it could mean you are in breach of the conveyancing contract. If your property is leasehold then we’ll also need copies of things like ground rent payments, service charges, and building insurance. If you haven’t got them we can get them from the freeholder or managing agents but this might take some time. What happens when we have all the paperwork? We send all the paperwork to the buyer’s solicitors and two copies ofthe draft contract. The buyer’s solicitors will go through this contract and make any amendments they think should be made. They then send one copy back to us. If we agree with their amendments we’ll send the contract to your for signing. We may have to wait a while to receive the paperwork from the seller’s solicitors. We then do the first searches on property and we’ll tell you what we need from you to get this started. This means an up-front payment as we have to pay up-front for certain information. The Local Authority search which will show; Planning matters which the owner should know about. This search doesn’t cover the neighbourhood. For example, if the property is next to an allotment you should ask us to check directly with the council about whether they have had or likely to get an application to build houses on it that spoil your view. You can always do this yourself with the local planning department.Inspecting plans of the area is a good idea and you can usually do this online. An environmental search - to check for things like contaminated land, risk from flooding, natural subsidence, radon gas, waste treatment plants etc. A chancel repair search is to find out if you will be liable to any repairs to the Anglican Church building for the parish where the property is. The church building might be located many miles from the property. A mining search - this usually takes place if the area is one where there are mines and will discover whether there are any subsidence issues associated with them. What happens if we find something that we think is a serious problem? Before 1925 all land in England and Wales was unregistered. If this is the case with your property, the only way to check the seller owns the land and can sell it to you is to look at the most recent, 15 year’s worth, of Deeds. This may give us the information we need but many times we have to go back a lot further than this which turns it into a time-consuming detective process. Don’t worry, we do find out whether the seller has the right to sell eventually. It’s just that it may cost a bit more...although we will always ask for your approval on this before going ahead. Since 1990 I am glad to say that all unregistered properties have been registered when they have been sold, which makes life a lot less complicated. What other documentation from the seller’s solicitors do we look at? If there’s anything that concerns you please ask about it. And a good tip is to do some research on the internet with the local newspaper website to see if there are any issues that might affect you buying the property, especially if you don’t know the neighbourhood that well. When we’ve done all the checking we’ll write to you and send you the contract and other documents that you have to sign. Things you may want to know about conveyancing but no-onehas taken the time to tell you about...until now. What happens if I don’t want to buy or the owner doesn’t want to sell any more? People do change their minds. There’s not a lot you can do about it if it affects you negatively. On the other hand, if you want to change your mind it’s a good thing you can as long as you do it before exchange of contracts. And we recommend that you invest your time finding another buyer or looking for another home if this happens. I’m buying a property jointly with someone else. When you buy with someone else, for example your spouse or unmarried partner, you have to think about what would happen to the home and the money invested in it if one of you were to pass away. The two ways a property is co-owned are Joint Tenancy or Tenancy in Common. If you buy as Joint Tenants and one of you passes away, then the property goes to the survivor irrespective of what the Will says. The survivor could sell the property and keep all the money. And if you were to die at the same time, for example a car accident, the law says it’s the younger one died last so the property will go to the younger one’s family. Remember; Up until exchange of contracts the person who changes their mind does not have to pay anyone else's conveyancing costs. Married couples usually buy as Joint Tenants, which means the survivor can live in the home as long as they want to and there is no Inheritance Tax to pay on the transfer of the home into the survivor’s name. Some people may have a lot of money and for tax reasons it can be better to have the property held as Tenants in Common or just in one name. If you are concerned about this you need more advice so please do let us know or speak to your financial adviser. What about unmarried partners buying a house together? And if Tenants in Common have invested differing amounts in purchasing the property it’s best to highlight this in a document what share each partner owns. Bear this in mind that the law does not give unmarried partners thesame protection as married ones. Why do I have to show proof of identity? The reason we ask for proof of identity is because we have to. It’s the Government regulations and we must have it because we can’t do your conveyancing without it. Quite simply it’s protection for the seller. If your buyer doesn’t complete by the date in the contract then you can sue for breach of contract and claim compensation for all your losses and expenses. But this doesn’t help you much if the buyer simply disappears. You can’t sue someone if you can’t find them. And in certain circumstances this deposit can be kept by the seller to cover the expenses. The fairly large deposit typically 10% is there to make sure the buyer completes the deal. Can I use the deposit towards buying my own house? The short answer is yes. You can use the deposit you receive when selling as your conveyancing deposit for when you are buying. You can’t have it deposited in your bank account (unless the buyer agrees to this). There’s a small risk in using the deposit you receive because the seller could become bankrupt after exchange of contracts but before completion. But this is a rarity. Do I have to read the contract before I sign it? Conveyancing contracts are long, with more than 100 clauses. You can assume we know what we are doing and have checked all of them. That’s our job, (and we are heavily regulated to make sure we are doing our job by the Solicitors Regulation Authority). If there is anything out of the ordinary we will explain these clauses. One thing we should point out is that all contracts refer to a rate of interest, (usually 4-5% above Bank Base Rate) which is interest you will be liable for if you as a buyer do not complete on the due date. This amount is based on the selling price of the property. Likewise if you are a seller you can claim this if your buyer fails to complete on the due date. Do you send me plans of the property? Yes we do. As you have seen the property please make sure the plans match up with what you expected. If the plans don’t show part of the garden that you saw, then tell us! What’s this Restricted Covenant that covers my property? There are many properties affected by these covenants. They basically tell you what you can or cannot do with a property. If there’s one that affects you we will make sure that we send it to you. You really need to pay close attention if you are planning any building or other changes to your property as the covenant could prevent you from doing this. Will you make it clear what I have to pay you for? When it comes to money, solicitors are very heavily regulated – basically you should know your money is safe with us. You should now sign the Contract(s) and send them back with any payment we have asked for. If you use a personal cheque for the deposit this has to clear before we can exchange contracts. If you use a Building Society cheque or bankers draft this is better. Signing the Contract does not commit you. You are not actually committed until we exchange contracts on your behalf. When Can I Move In? Is it the Completion Date? YES, You Can Finally Move In. This date is agreed before the exchange of contracts and is written into the contract. There used to be 28 days between exchange and completion but that period has now reduced to something like 14-20 days. That’s because it still takes a lot of time to get your mortgage money. It’s a good idea in theory but...not wise in reality. Until the exchange of contracts either the buyer or seller could pull out on the day you are intending to move on. This is pressure that you don’t want to put yourself under. How Will I Know When Contracts Have Been Exchanged? When we exchange contracts we will let you know. It’s a complicated procedure that usually takes a few hours to finish off but as soon as it is done, we’ll be in touch. What Do I Do About Buildings Insurance? If it’s your home you are selling you want to keep it insured until completion as it is still your property. If you are buying get it insured when contracts have been exchanged. Your mortgage company may arrange insurance if you are buying so do check with them. If you don’t have a mortgage then you’ll have to arrange it yourself. Are there any other checks between exchange of contract and completion? Yes we do have to check if you have ever been made bankrupt and we have to check if anything has changed in terms of the property title at the Land Registry in the last two weeks. You will have to give details of any life policies that are used in connection with your mortgage – otherwise your lender might not send the mortgage money. arrange for the meters to be read on the completion date. doctor, dentist, employer, tax office, DVLA etc. Arrange to hand over keys via the estate agents. Will You Pay My Estate Agent on my behalf? Usually the Estate Agent will send us your bill and we’ll pay them from the money we receive. Will You Pay My Mortgage Company on my behalf? We’ll work out what you owe on your mortgage and arrange to pay this to your mortgage company as soon as we get money. What Happens About Moving In On Completion Day? time you should be out or can plan to move in. afternoon move in rather than a specific time. Once I move in have you finished with me? We are still working on your behalf even after you have moved in. work better on your behalf. in the day we need time to send documents out. an appointment so that they can be available. Your office isn’t local to me, does that matter? even Skype us if you like. What about signing important papers? just return them to us. What about proof of identity, don’t you need to see it? identity are valid as proof. If I am a cash buyer why does the money have to go through your client account? Because when your solicitor has control over the money you are protected. That’s why! If we don’t control the money then we don’t have control of the conveyancing process and when monies are sent and received. If someone else says they will pay my legal fees, can you deal with them? No, we are retained by you and have to be paid by you. But we can send a copy of the bill to them if you would like. Can I have a parent overseeing my matter? Is there a charge 'To Repay a Mortgage or Loan or Remove a Charge even if the mortgage has been paid off? Sometimes this does apply because technically although you don’t owe the lender there is still discharge paperwork to be registered. And this still generates a lot of work for us and will mean we have to charge for them. Your quotation seems pretty good considering all this work, are there any hidden extras? We’ve been as open as possible with explaining the work we do. And our quote will contain no hidden extras. We look forward to you using us! But don't some Mortgage Companies insist that their Mortgage is signed in front of a solicitor? This is a rarity nowadays. If your mortgage company does require it and you can’t come to our offices we can arrange for you to sign at a solicitors local to you. It will probably cost £20-£30. Why does your quote include a small amount for Indemnity Cover? We have indemnity cover to protect you which is £2 Million for any claim. This is good news for you as by using a solicitor you know you are fully protected as possible. The cost of insurance has increased substantially to tens of thousands of pounds over the last few years and our client pay a small contribution to this cover. When do you stop acting for me? Our retainer ends when everything has been completed. We’re happy to hear from you any time of course about any other legal work. And if you have minor question about your completed conveyancing please get in touch. If we have to retrieve the file from storage, (we keep your files for six years) then a small charge will apply. 1. The solicitor's basic fee (i.e. what it costs to do the work). Email help@SolicitorsInBournemouth.com to choose us as your Conveyancing Solicitors for Bournemouth. 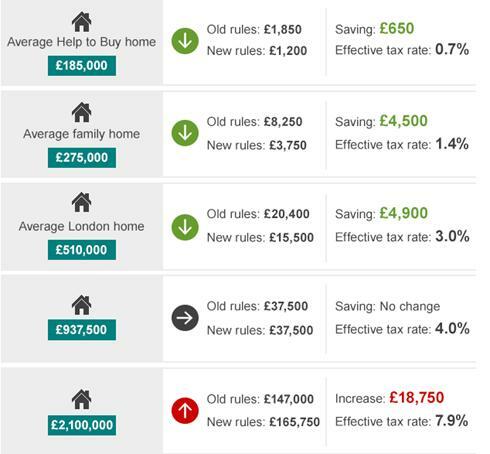 PS You may want to consider the implications of Inheritance Tax when you purchase a property. Feel free to visit our Inheritance tax information.